Back at the beginning of July, Graham and I went away to Bath for a few days as part of my birthday celebrations. Though it was a very fleeting visit, being the planner I am, I made sure we had plenty of choice in terms of activities and eateries. My friend Mandie asked me for some recommendations recently as she’s also planning a trip, and it made me realise just how much I had to share. I put a tweet out before I visited and received a wealth of knowledge from people who know Bath a lot better than I do – so if you’re planning a trip soon, this post has you covered. Let’s start with my favourite part! Being a total foodie, a lot of my trips tend to revolve around food, and Bath was no different. I’d been to Bath very briefly back in MAY for a hen do and had a delicious thai meal, so heading back there with Graham was top of my list. It’s not a one off in Bath, though, as I’ve since found out there are a few restaurants around the South – but Koh Thai Tapas was a big hit for us. For a special breakfast, we booked The Pump Rooms. Recommended to me by my friend Mo, it’s set in the most gorgeous Georgian room and overlooks the Roman Baths! It felt extremely fancy and we were well looked after. Though we went for breakfast (and I tried maple bacon pancakes for the first time! ), they also do lunch or afternoon tea and booking is advised. It felt very luxurious and high-end, within a pristine setting and impressive chandeliers, as well as housing the grand water fountain that supposedly contains curative water. Friends warned me not to drink this though, so do so at your own risk of ill health rather than miraculous medical cures! Boston Tea Party, down on Kingsmead Square has come highly commended by a few others, and looks like the perfect place for a cuppa and a slice of cake. Though if you’re after something street, Sally Lunn’s buns is infamous for its sweet brioche bun. It’s tucked away up a side street (North Parade) and was extremely busy when we visited, so I’m yet to try one for myself. My friend Emma recommended a couple of places in Kingsmead Sq including Society Cafe and Swoon Gelato – gelato is my weakness but unfortunately we ran out of time! If you fancy pizza, Dough or The Oven come highly recommended, too. Let’s start with the obvious ones, and the places that were recommended to me multiple times. You can’t go to Bath and not see the Abbey – whether you go inside for a tour or not, it’s impossible to miss and a stunning church. The Roman Baths are an extremely popular tourist attraction and no doubt one you’ve heard of! Steeped in history, the baths are very well preserved and grand, housing various artefacts found on site. The baths are open air and below street level, with impressive columns and a great insight into the Roman era. As you head north, through the shopping streets - I was surprised at just how much retail space there is – not just the main high street but also a large shopping area to the right of you) you’ll find The Jane Austen Centre on gay Street. It’s a small museum but a must if you’re a fan, and there’s also a Regency tearoom housed here, too. The Royal Crescent is also infamous – a row of terraced houses in a sweeping crescent overlooking the green opposite. It’s very impressive with the columns and curves, and if you’d like to see an authentic representation of how it used to look back in the 18th Century, No. 1 Royal Crescent is a museum you should explore. I think the land opposite the crescent is a great place for a picnic, and I particularly loved the walking back down Royal Avenue to the main town being surrounded by beautiful flowers and woodland. There’s a Georgian Garden here and Adventure Golf, so plenty to explore. Next to Royal Avenue is The Circus – another impressive layout of Georgian architecture. In Latin, the name translates to ring or circle – which is exactly what you’ll find because no matter where you enter, you’ll be greeted with a classical facade right in front of you. Again, there’s a green space in the centre though it gets busy and there are quite a few tour groups that congregate here. 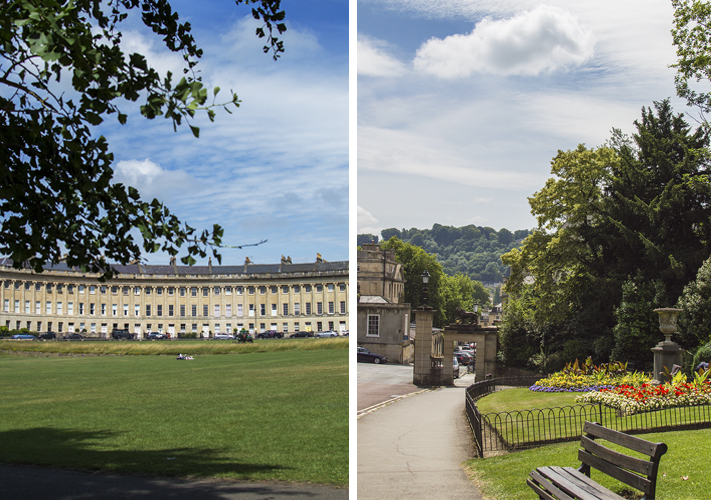 Harriet (who lives in Bath) recommended a few areas that are out of the immediate town centre and perfect for seeing other parts of Bath, but still easily within walking distance. 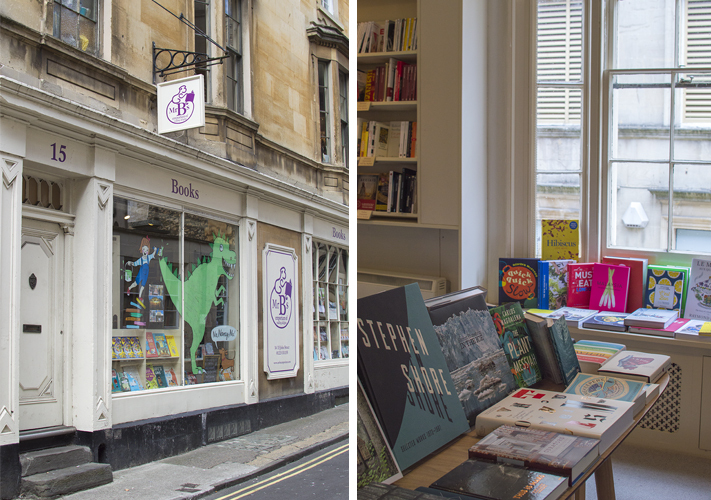 Head to Walcot Street for the independent shops, and walk down Great Pulteney Street to find Sydney Gardens, tucked behind the Holburne Museum. There’s plenty of green space here to spend a chilled afternoon, and having the Canal running through it makes it a picturesque spot. My final recommendation for activities is another spot that often comes up in conversation if you mention Bath, the famous Thermae Bath Spa. Extremely popular and one of the city’s main attractions, the hot spa water is fed from Bath’s hot springs, with five floors. It’s glass walls inside is a stark contrast to the historic beginnings, and contains a huge amount of activities, including indoor and outdoor pools, spa treatments and steam rooms. When I visited on the hen do, the queue was out of the door and you can’t book spa sessions (only treatments or if you’re in a large group), but we booked the Cross Bath, just over the street. We had our own private pool and it was perfect – totally shut off from the busy streets outside and in our own little world. Like I mentioned above, there is a HUGE amount of shops in Bath so plenty of opportunity for some retail therapy. I loved how a lot of the shops are housed in Bath stone so the exterior doesn’t look like every other high street. For books, head to Mr B’s Book Emporium on John Street – I could have spent a long time here as it was such a charming place packed to the rafters with beautiful books. I didn’t manage to make it to Minerva Art Supplies, but did visit Rostra Art Gallery on George Street. It had one of my favourite artists showing there, Charlotte Farmer, as well as a good selection of contemporary art. It’s only small but it was lovely perusing the work of local artists and seeing a gallery doing so well. Emma also recommended Grace & Ted if you like designer goods – but without the designer price tag! It’s an independent store run by a Mother and Daughter - a perfect place to find something special. For parking, we had no trouble finding a space in Avon Street. There are also long stay car parks on Manvers St and Charlotte St, which are to the north of the city. We stayed at this lovely Airbnb that was a quick drive from the city centre, self-contained and very comfortable. There is a Travelodge in the heart of the city which we would usually choose, but parking isn’t included and it was cheaper to go with Airbnb. Tony was a great host with excellent communication. I told you I had lots to share! Sadly we were only there for a day and a half but there are plenty of recommendations here for a longer trip! Bath is so charming and I love the historic feel of it – the bath stone gives a warmth to the city and I adored the architecture. It certainly helped that the sun was shining for us but I’ve no doubt it’s just as lovely in the rain. Have you got any cities in the UK that you have a soft spot for?